Fitzgerald’s failure is the book dealer’s holy grail. Now I have just read The Great Gatsby, published by Scribner’s, with a note on the book jacket to the effect that “it is a magical, living book, blended of irony, romance and mysticism.” Well of course, I suppose the Scribner jacket writer wants to well as many books as he can, otherwise I swear I would think he had gone completely mad. Find me one chemical trace of magic, life, irony, romance or mysticism in all The Great Gatsby and I will bind myself to read one Scott Fitzgerald book a week for the rest of my life. The boy is simply puttering around. A few positive reviews remained (“New Fitzgerald Book Proves He’s Really a Writer,” The Chicago Daily Tribune), but Gatsby sank out of sight. The first printing of 20,870 copies eventually sold, and Scribner printed only 3,000 more. When Fitzgerald died fifteen years later, there were still copies of that second printing on warehouse shelves. In 1934 Gatsby was briefly revived by the Modern Library, but was discontinued when it failed to sell 5,000 copies in five years. It wasn’t until World War II, when the Council on Books in Wartime distributed 155,000 paperback copies of The Great Gatsby to American troops, that the novel found its audience, emerging as a perennial contender for the title of Great American Novel, and launching thousands of high school essays on the symbolism of the green light. Today, ninety years after its first appearance, The Great Gatsby is a backlist star, selling a half-million copies every year. In the rare book trade, where I make my business, Fitzgerald’s glorious failure is one of the most sought-after modern first editions: a book that people love to see and hold and discuss, even if they have no intention of buying it. Like The Adventures of Huckleberry Finn and The Catcher in the Rye, The Great Gatsby is a novel widely assigned to Americans at an impressionable age, so that even people who might not consider themselves readers have read The Great Gatsby, or feel that they have. It’s a favorite “favorite book,” and a sentimental object of desire: the unusual first edition that appeals beyond the circle of serious book collectors to a larger community of readers. There are copies of Gatsby available all the time—like Huck and Catcher, the first edition is always obtainable, if you have the money. (A copy is currently available with an unrestored dust jacket for $150,000.) For rare book dealers, talking about the value of The Great Gatsby is an easy way to introduce new collectors to the logic of the book trade, because what’s true of modern firsts in general is wildly, extravagantly true of Gatsby. 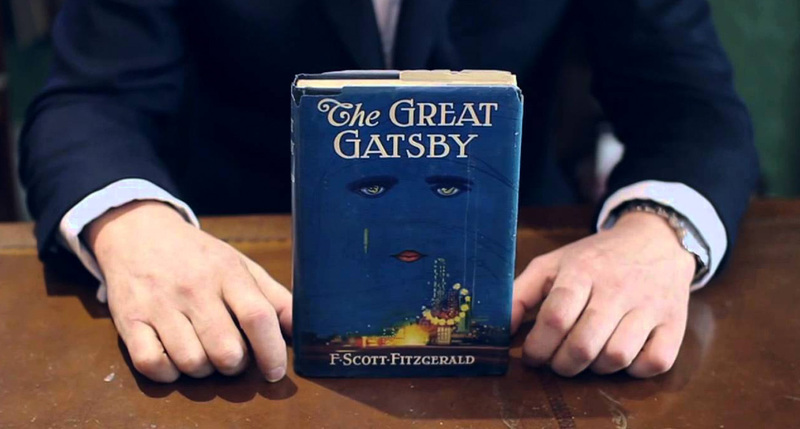 The first edition of The Great Gatsby isn’t a particularly scarce book. A first printing of twenty thousand means there will typically be multiple copies for sale. (Sylvia Beach published just one thousand copies of James Joyce’s Ulysses in 1922, and Scribner would publish five thousand copies of Hemingway’s The Sun Also Rises in 1926.) Collectors draw distinctions among the first twenty thousand copies of Gatsby, narrowing the field a bit. There were five typos in the original setting of Fitzgerald’s text, gradually corrected over the course of the first printing, so the most desirable Gatsby will be a first printing, first issue, with all five mistakes present. (For those playing along at home: in the first issue, on page 205, Meyer Wolfsheim’s secretary tells Nick Carraway she’s “sick in tired” of young men trying to force their way into the office.) Even so, uncorrected first-issue copies come up all the time, with dealers and at auction and on eBay, perhaps at a church jumble sale near you. Budget $5,000 for a “fine” quality first printing, first issue Gatsby, without the dust jacket. Not everyone was a fan of The Great Gatsby’s cover art. Hemingway famously complained in A Moveable Feast that it looked like “the book jacket for a book of bad science fiction.” From the 1930s through the 1970s, Gatsby was reissued with a series of different cover designs, including Alvin Lustig’s crisp take on the dollar bill for New Directions. But Cugat’s original design, like the novel it influenced, gained admirers as the years passed. Revived and reproduced on T-shirts, tote bags, and posters, that glittering nighttime scene defines Gatsby for contemporary readers. When Scribner briefly offered a photographic cover featuring the stars and starlets of Baz Luhrmann’s 2013 3D film adaptation, readers rebelled: “We never even took the nonmovie tie-in edition out of print,” Scribner editor-in-chief Nan Graham said. 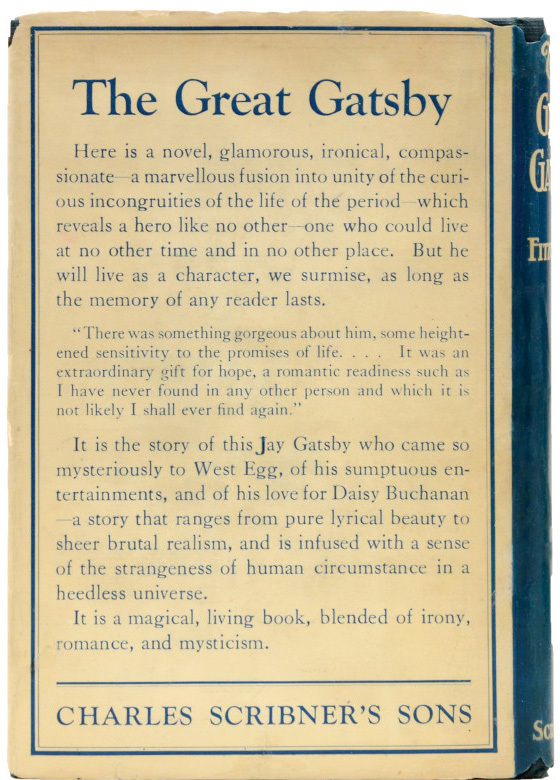 “And still we got into trouble.” And so that first-edition jacket, timeless and virtually priceless, turns obsessed collectors into Gatsby—except unlike the trifling Daisy, the book justifies the tribute. Heather O’Donnell is the owner of Honey & Wax Booksellers in Brooklyn. She has worked in the rare book trade since 2004.